To coincide with Halloween, Digital Shoreditch arranged an appropriately themed hack day – the ‘Scareathon’. We headed down to the Ravensbourne campus on a crisp autumn morning with some random boxes of technology, and a few harebrained ideas about how to scare folk. Fuelled by unlimited sweets, pizza and energy drinks, we managed to hash our ideas and technological bits-and-bobs into an audio/visual and hardware based installation – the ‘Humanity Test’. The idea behind our creation was to make a futuristic version of the feely-box, where you stick your hand inside a dark box and strange things start to happen! 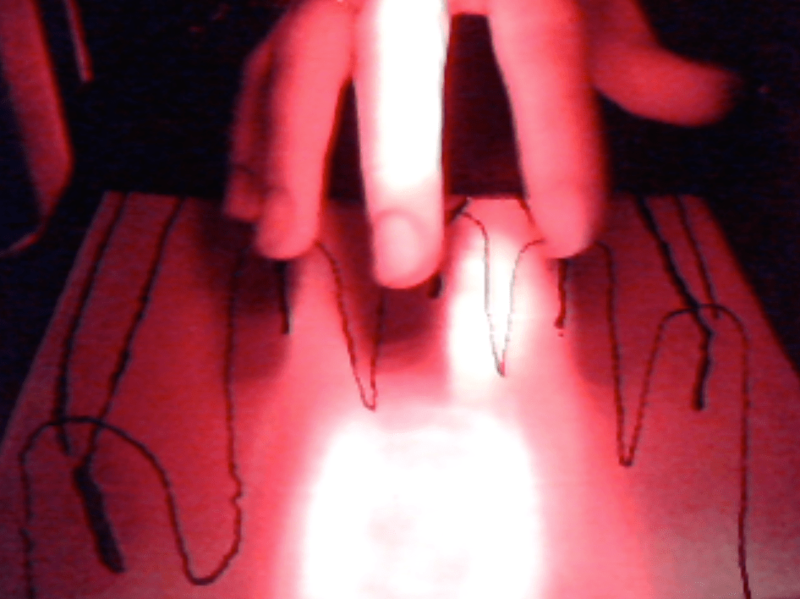 We used a Makey Makey, an old theatre light, some conductive paint, and a webcam to put together our multimedia feely-box. Using MAX and Ableton Live we then created an interface which led people through the Humanity Test. Instructed by a HAL style voice they monitored their hand on screen and performed a distractive task which culminated in a sudden electric shock sound accompanied by the sight of a scissor-wielding hand snipping at the their fingers! We had a fantastic time and our Scareathon hack was judged the scariest at the end of the day, which meant that we were featured on the MSN UK tech blog. WOOT! Thanks to my wonderful co-collaborators, Alex and Rob!